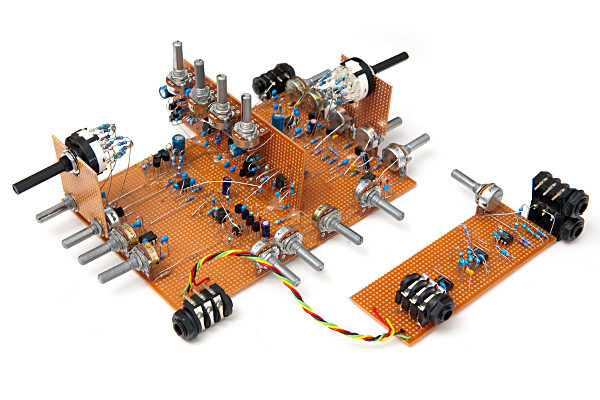 I've long been involved with music electronics and more recently was working on another guitar amp project. That didn't work out as a viable project, but what I did end up with is the building blocks for an analogue distortion and dynamics processor. If you will, the stuff that makes a classic valve amps sound so good. It's early stages yet but I have a working prototype that does the right sorts of things. There is a lot of work and tweaking needed yet. The biggest problem on this prototype is noise. This is mostly simple thermal noise due to the excessively high impedances in a filter on the input and with a bit of work this should be easily reduced to an acceptable level. There is also some nasty noise creeping in before gain stages due to an unfiltered servo. I'm not a guitarist (neither where Jim Marshall or Leo Fender!) so I nothing fancy here - just a few basic 2-note chords on a cheap strat clone (does have good pickups & strings though), but it should be enough to give the general idea. I have applied a little reverb afterwards as this would typically be the scenario in use. The processor has 17 pots to control the sound (excludes level controls) plus two 6-position switches. At the extremes of the ranges that's 524288 possible combinations at the extremes of the controls. Being analogue controls you get all the decimal places in between - there is really a universe of sounds in this thing and it's only practical to put a tiny fraction of them up here - I've tried to show a selection over a large enough range to give an idea of the variety. Also, as mentioned above, there is an easily solvable noise problem on this prototype so things are a bit hissy in the recordings, especially at high gain. As if that isn't enough, I have heaps of computer equipment around producing interference that guitar pickups seem very good at receiving. Not very clean recordings at all. Except where noted, all recordings are actually of the built in emulation rather than a miced up speaker. The processor has a built in amp/speaker/mic emulation which allows it to be taken directly to a mixer/PC/stereo/PA etc. without needing to take it to an amp and mic that up. Of course you can also do that. The emulation is based on measurements taken with the industry standard mic, the Shure SM57, with real guitar amps. Currently there is only one personality to the emulation but I will add a few more as I get my hands on different amps to test them. There is also a headphone output from the emulation so this processor could be used as a headphone practice amp by it's self, and the headphone amp has been designed to give good levels with a range of different headphones from low-impedance earbuds up to high-impedance audiophile cans. For now you can compare the difference between micing and the initial emulation. The emulation is not intended to be exactly like micing, but to give something very workable where further processing and EQ can be applied. Currently it's much more of a big "studio" sound emulation where the SM57 miced amp is more of a harsher "live" sound to cut through. Additional emulation personalities will include a combination of both "live" cut through the mix emulations and big "studio" sound emulations. The compressed audio seems to be making a mess of the tops with the real amp. Most people think that distortion and other artefacts in the sound doesn't matter with guitars - guitarists invariably want some distortion added anyway. That's simply not true. Guitarists want specific pleasurable distortions and not nasty uncontrollable distortion. Really what we are aiming for is a really clean system which then specific distortions can be applied to in a controllable way. In many ways this design shares aspects with early analogue synths in that it provides a comprehensive array of tools for shaping sound using mostly discrete electronics, just in this case the the sound is produced by a guitar rather than an oscillator. This allows anything from light crunch through to sustained roar/scream, but as it's a soft clipper it lacks the glassy/crackly top-end. This is intentional - we can always harden up the clipping to get the glassiness in a later stage, but we can't easily soften up hard clipping at a later stage. This is where the magic starts to happen. This stage allows the clipping to be varied between soft and hard, and by backing off the first gain and running the wick full up here can give hard crunch, or by pushing the first gain and backing off here gives soft crunch. This is all variable so the exact distortion sound can be controlled. The difference with crunch is very subtle as the distortion is very brief and there isn't enough gain to achieve any heavy effect. A key aspect of classic valve guitar amps is that when the power amps distort, there is a distinct shift in the sound. This is due to a number of factors including the filter network formed by the output valves in conjunction with the transformer and speaker loading. In linear (non distorted) operation the feedback loop corrects all this leaving the amp largely flat and in control. When the amp hits the rails, the feedback can no longer correct and the filter characteristics take over. This means that there is a distinct shift in sound between clean and distorted. This design provides a controllable mechanism for this with dynamically controlled filters which can be configured and a control to set how much they shift when the limits are hit. This allows going from a bright clean sound to a ballsy distortion or from a mellow clean to a screaming distortion all controlled by how hard you play. The key thing is that you can control all this - the amount effect as well as the particular effect it's self. What is happening here is that low harmonics are removed during distortion (shift-up), or high harmonics are removed during distortion (shift down) in each case. Below distortion levels the full bandwidth is operational so far as possible. Classic Valve amps suffer from supply sag which gives them a subtle compression to the sound. This is a combination of output compression (ie. in the power amp) and input (pre-amp) compression. This design provides controls for both pre and post compression, and how rapid the speed of the compression. This means a whole variety of possibilities: a note can be sustained on the verge of distortion, the initial edge can be taken off or exaggerated, gentle clean compression can be achieved, or in fact a combination of all that. Post dynamics is again a much more subtle effect. All the slower response does is allow a slightly stronger attack on the note. What is really needed is to speed up the response so there is more useful range. Currently the slow end is unusably slow, but the fast end is about what should be middle-fast. This is all about signal conditioning, high gain and the hardness of the distortion. That's just a few! All these where done with the maximum shaping, but a smoother (less rasping) sound can be achieved by backing off the shaping. Hopefully have some more samples to add soon. This box is designed to have virtually infinite possibilities so this is barely scratching the surface and there's a whole lot more possible. Add to that some additional effects and amps, mics, and mastering techniques and there is little hope of even imagining what is possible. I'm hoping to start getting some feedback from experienced guitarists soon and will be refining the design so stay tuned for more on this.